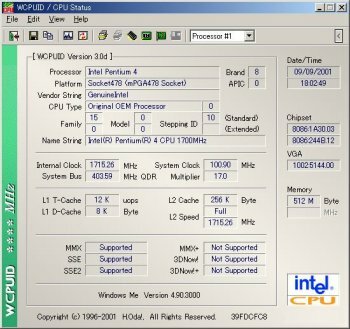 WCPUID will tell you everything to know about your CPU and motherboard devices. It calculate clock speed to two decimal points, and is a great companion to SoftFSB. In addition, it can also tell you if the CPU supports MMX, 3D-Now!, SSE(KNI) technology. Blue screen when attempting to run WCPUID! I'm running Windows Server 2003 Enterprise Edition SP1. I've heard this was a good program, but my only use has resulted in a blue screen so I'm going to have to give a rating of 1. CPU-Z is a similar program to WCPUID but it shows voltage and clock speeds in real time. It also displays a chart for Cache Latency. It's freeware and available here: http://www.cpuid.com/cpuz.php The issues of missing images and no 'real time' displays are problems that need to be addressed in WCPUID. By far one of the best proggies out there! I've used it since back in the days when there weren't may utilities, if any, that showed you your FSB. Was indispensable for OC'ing. A nice compact tool that does more than any other of its kind. A "must have" for overclockers and the curious alike. Wonderful program. Very simple, very clear, no BS. Great for seeing just what your overclocking efforts have done so far. WcpuID 3.0 is quite an improvement over the earlier versions. Easily 3 times as much info as before. It's a must have!! My solution to the "problem" you describe, is to hold down the key while clicking a link. The URL will open in a new window. This works in any IE-based browser. mpopov@acticode.com if you have problems with getting it installed or run. The company offers a discount for bug-reports or free registrations in case the report greatly helps.